Poole Pottery is based in the town of Poole in Dorset. 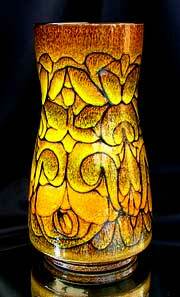 They produce decorative and ornamental art pottery that has become very collectible. Poole was set up in 1873 as Carter and Co. and started out by making architectural ceramics incuding tiles and ornamental ceramics used in the building industry. By the early twentieth century, Poole Pottery began to produce more decorative and ornamental pottery intended for display, and since then they have never looked back. Poole have become one of the leading factories producing art pottery alongside their tablewares and this has made them a very collectable factory. Art pottery manufacturers and designers tend to specialise in different things and in some cases it is novel shapes or surface patterns, in others the emphasis is on glaze effects. 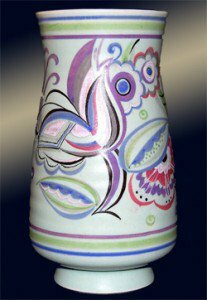 In the case of Poole Pottery, from its early days to the present the main thing that makes their art pottery distinctive is the use of hand painted decoration. The earliest pieces of art pottery made by Poole in the period from 1900-1918 had rich lustre glazes with almost a metallic sheen to them. In the period immediately after the First world War Poole Pottery came under the influence of the artistic ideas of the Bloomsbury group, with Roger Fry and Vanessa Bell (Virginia Woolf’s sister) working in collaboration with Poole to produce pottery designs for their own Omega Workshop. During the 1920s Poole used the influences and styles of mediterranean peasant pottery for their own modern ornamental wares. In the 1920’s Poole experimented with pottery designs that used floral and animal motifs. These were very popular and became a hall-mark of Poole Pottery – what has become known as their Traditional Wares. They were in production from the 1920s to the 1960s. They are still very popular today and are highly sought after by collectors. As well as being influenced by outside artists, Poole Pottery also produced some of their own designers who went on to produce innovative and modern designs. Truda Carter, Phoebe Stabler, Ruth Pavely and others working for Poole during the early twentieth century produced a range of designs that are now highly collectable. At the time when the company was trading under the name of ‘Carter, Stabler and Adams’, the art-deco designs that Poole produced during the 1930s are very collectable. More subtle in their patterns and colours than Clarice Cliff, Poole’s art-deco designs capture the spirit of the jazz-age well. They adapted their floral and animal designs to a more abstract, angular and geometric style that was all the rage; and these Pole Pottery wares are now highly sought after by Poole Collectors. Lucien Myres was appointed director of Poole and after post-war design council restrictions were lifted in 1954, Poole sought to return to its art-pottery roots. They began to develop a new and modern look in ceramics and Alfred Read was hired as chief designer. He produced a range of freeform designs that were modern, organic and simple in style and which have come to typify 1950’s design. Poole set up a semi-independent studio within the factory in 1958 to produce studio pottery. Headed by Robert Jefferson and with Tony Morris as a key designer. From 1962 they produced a range of studio pottery that later became a model for the well-known, brightly coloured Delphis range of the 1960s and 1970s. Poole also produced two other noted art pottery ranges in the 1970s: Atlantis and Aegean as well as some limited edition stoneware animal figures. It re-established the studio and began producing new ranges and also hired a number of independent artists and designers to produce one-off and limited edition designs for Poole (e.g Sally Tuffin, Janice Tchalenko, Tony Morris (again), Sir Terry Frost, Alan White etc). Poole is now back where it belongs, not only producing a wide range of useful tablewares but continuing to be at the cutting edge of art-pottery design in Britain. Wares from all periods of Poole’s history are highly collectable with prices ranging from a few pounds to several thousand. Poole Pottery marks appear on all but the very earliest pieces. The most common mark being the Dolphin mark. The Carter Stabler Adams mark shown above is the earliest form of Poole pottery mark. The most affordable Poole is the tableware from any period. Made in large volumes it is very common and generally very cheap to buy. Indeed, in addition to new, still-in-production decorative items, most of the Poole items that you will see for sale on eBay and in auction houses are tablewares of little value. Good if you want a cheap and stylish set of retro crockery for everyday use. The best and most collectable tablewares are probably the contemporary designs of the 1950s. Including patterns like: Ripple, Ariadne, Constellation and Feather Drift. Today, Poole Pottery continues to produce striking vibrant designs like African Sky, Bamboo, Columbine, Decadence, Flamboyance, Gemstone, Himalayan Poppy, Imagination, Indulgence White, Infusion and Volcano. Poole Pottery can be an acquired taste. The abstract designs do not appeal to everyone, but dedicated Poole collectors really appreciate them.